For this assignment students work in groups to write a skit in Spanish about individuals of different professions who encounter one another at a school career day. 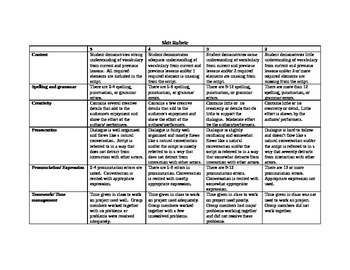 It details requirements for the skit and includes a grading rubric. My students both write and perform skits in Spanish II. This provides an outlet for creative writing and acting as well as application of the vocabulary and grammar components of the unit. Plus, students have lots of fun with it! This assignment corresponds with Unit 8, Lesson 2 of the Avancemos II textbook, but could easily be used with other curriculums as well. I assign one skit per unit, so visit my store to find other skit assignments as well. 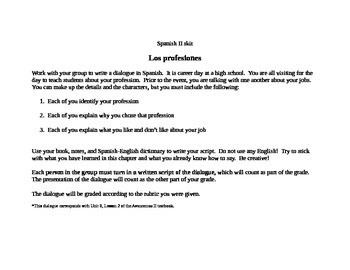 You may purchase all 8 of my Spanish II skit assignments as a bundle at a discounted price.